Mason and Creatures both come out swinging, the hard eights of an after-hours dice game breaking out in haymakers and knifeplay after Mason refuses to swallow any more ribbing about poppa Pony. Watch his back? Mason’s spent years looking over his shoulder, trying to outrun the shadow of Pony Reed. The man’s been a ghost for the better part of Mason’s life, but at heated moments Mason still finds himself choking on the musk of his father’s cologne; for a brief adolescent stretch, Pony materialized in the flesh, conscripting the boy as a fresh-faced wingman while juggling one-night stands and steady shack-jobs, father-son exploits that ultimately added a hair-trigger sexual dysfunction to Mason’s already simmering rage and self-loathing. Mason shucks off the suffocating weight of home and family, hitching a ride from Indiana to D.C. with nothing but a duffel of clothes, a stolen pistol in a paper sack, and that inherited bellyful. Brooding and ungainly, Terrell is a normal high school student who mischance and a handgun make Cain in Bennett’s second novel, The Lie. Long overshadowed by his charismatic, varsity-athlete brother, Terrell has grown accustomed to going unnoticed – until that gun fires and leaves his brother dead on the front porch. Panic – followed by an ill-considered cover story, in which Terrell tries to pin the shooting on a pickup full of rednecks. Set in mid-seventies Evansville, The Lie tests the tensile stress of that fabrication on Terrrell’s working-class family, on the divided black and white communities, and, of course, on Terrell’s own conscience, the lie stretching grim and thin before the deceit collapses in on itself and Terrell is cast out. Though dissimilar in disposition and outlook, both Terrell and Mason share a laryngitic smoldering, a voicelessness so ingrained that rather than engage in emotional exchanges they burn in silence, choking down the unspoken ashes until they can barely breathe. Each young man has also been raised with an acute awareness of their families’ precarious footing, scraping for years to move from project housing to freestanding homes, living paycheck-to-paycheck, no rich uncles, no alumni associations, no established economic base, one misstep can bring their entire lives crashing down, a truth that motivates Terrell’s lie and fulfills itself in the aftermath. In Mason’s case, that strain is passed down by his mother, Gail. Desperate to keep her boy from straying, her open hand is the one that delivers the most devastating blows. A perpetuating lesson, that from a powerless position the sole exercise of free will is to internalize the blow, spiting the dominant force with a clenched jaw – except, the only possible exercise of free will hardly constitutes “free will.” Learning to equate defiance with choice, years of swallowed pain calcifying into a harder and harder shell, Mason steadily grows more prone to fall into the exact cracks and traps Gail thought she was wearing out of him. “You don’t know nothing, the belt ain’t taught you.” Say that. Remember when we were young enough to remember? Taking its title from “The Doxology” and borrowing Plainsong’s mode of naming each chapter to correspond with its focal character, Creatures’ narrative soon shifts from Mason’s quest for retribution to Gail’s spiritual efforts to reconstitute a family. Tied to her proprietorship of a creaky boarding house, mother Gail has hurts to unscroll: the haunted memory of a daughter forcibly put up for adoption after a teen pregnancy; the still-snarled relationship with her ex-husband and co-leaseholder, Dan Neighbors; the fear of harms and slights lurking in wait for their obedient younger son, Tyler; the lingering sense she failed to do right by Mason – that is, before he left home without a parting word. At prayerful moments, Gail indulges vivid fantasies of her lost daughter, reliving the moment of supreme need when both family and church let her down. All the while, Gail remains blind to what she already has under her own roof – her boarders, grandmotherly Miss Annie and waif-bodied, single-mom Jackie. Gail drags Miss Annie, Jackie, and Jackie’s baby to Sunday service just as she once hauled Dan, Mason, and Tyler through a succession of churches, Baptist, Holy Roller, African Methodist Episcopal, her fake-it-‘til-you-make-it faith leading her on a vague search for that critical safety-net. Even within the makeshift family of the boarding house, Gail’s instincts are controlling: she corrects Miss Annie’s lapses with condescension and Jackie’s irresponsibility with a punitive cold-shoulder. And the results are much the same: more prayerful moments, more hurts to unscroll. The nine-year old, army brat narrator of Bennett’s debut novel, The Colored Garden, Sarge sees his world upended when his parents separate during a post-Vietnam tour of duty in Germany. At loose ends, his mother brings him and his older sister back to their grandparents’ farm in rural Kentucky; setting out in search of steady work in Louisville, Sarge’s mother leaves the children behind with her parents, a practical necessity which the boy interprets as an unforgivable abandonment. at first, more important than what changes them when it ends. Terrell’s redemption, Mason’s revenge, these family sagas are fostered by a coming of age which, like Sarge’s, turn sharply at the realization that no benevolent eye is constantly watching over – Sarge’s boyhood (and life) materially change as he metabolizes his perceived betrayals and learns to withdraw from others in turn. Mason’s life veered wildly at a comparable age: after Gail divorces Dan, given opportunities to maintain a functional relationship with his stepfather and half-brother, Mason snubs Dan and throws his entire allegiance on his mother’s side, an empathetic gesture that is neither recognized nor rewarded as Gail struggles to maintain her hectic schedule. Where Mason takes his wounds and latches on to older boys in back alleys and ball courts, Sarge’s growing pains lead him again and again to his grandmother, Ruth, who spends her days tending the unmarked graves of an old plantation cemetery. In a novel about storytellers, storytelling, and the way ghosts of the past infiltrate the present, The Colored Garden digs deep into Ruth’s back story, introducing a character type crucial to all three of Bennett’s books: the orphaned girl who goes from being on her own in the world to being on her own in the world, with child. 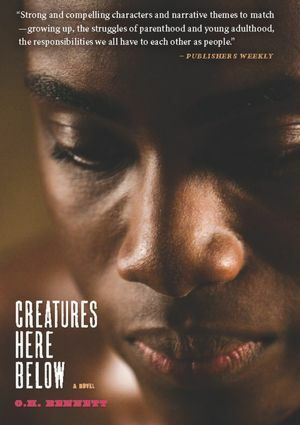 In Creatures, the cycle of the motherless child begins in Gail’s story and repeats with her boarder, Jackie, who was kicked out of her house at fourteen when her mother began to see the girl as competition for her boyfriend’s wandering gaze. Motherhood doesn’t particularly agree with Jackie, and in an indelible moment, Bennett dramatizes a stare-down between Jackie and her howling baby, the child desperately reaching for his mother through the slats of the crib. Writing his way along the Ohio River, O.H. Bennett has crossed back and forth through Kentucky, Indiana, and Ohio, progressing from the Vietnam-era to the mid-seventies and into the eighties, Sarge to Terrell to Mason, maturity and command growing with each successive book. An ambitious project appears underway, one that shares Mason’s final destination – though, in Bennett’s case, D.C. looms figuratively, in the benchmark of Edward P. Jones’ great, great (repeat that seven or eight times) great Lost in the City. While Bennett’s work doesn’t yet offer the line-by-line pleasures of Jones’ finest stories (too much exposition delivered via dialogue, not the same impeccable eye for era and neighborhood), the authors have a similar capacity to provoke recall: their narratives sink in. Bennett’s enduring strength begins with the methodical layering of telling details: Mason’s preference for fast food chains over roadside diners because at BK and Mickey D’s “the next in line always got served next”; a busybody pastor’s conspicuous switch in address from “Sister” to “Gail”; Dan reaching out to pat Tyler’s head with the sort of unpremeditated, paternal affection that Mason has never known. Though highly successful at molding his characters and ratcheting-up dramatic tension, Bennett has a recurring habit of dodging the moment of impact. Part of this is purely a function of character: in The Colored Garden, Sarge turns avoidance into an art, ducking off into the woods or hiding under the porch, locking himself behind doors and becoming so elusive that by the time he’s an adult he’s “made a career of that: being someplace else.” Likewise, the extended family in The Lie repeatedly respond to conflict by walking out on one and other, while the overarching narrative boxes itself in by obstinately withholding the details of the fateful shooting, refusing to give up the goods until the revelation is defused by anti-climax. Stone-walling, sidestepping, “being someplace else,” that pattern continues in Creatures. Flashbacks of Gail’s teen pregnancy return her to an isolated dirt farm, spirited away by her mother before local prying eyes can spot the tell-tale bump. When the contractions begin, Gail escapes, struggling across a field of dust and weeds just in time to flag down a passing truck. Her mother gives chase, pulling Gail from the road as the girl screams for her absent father – at which point the scene cuts away, not to be picked up again for another 150 pages. If there’s one thing an O.H. Bennett character knows for certain, it’s that after trusted figures have abandoned you, those people can’t just stroll back any old time and expect to pick up exactly where they left off. There are repercussions: hostility, frustration, withdrawal. In a phenomenal story like “The Girl Who Raised Pigeons,” Edward P. Jones doesn’t merely carve a rich family history and develop weighty metaphors – when the time comes to take up the burlap sack and wring innocent necks, he wades directly into the cage with the feathers and the viscera. When Bennett does bring his confrontations to a head, the results are cathartic – following the plural, pent-up storylines, the arcs of Gail and Jackie come together in a hard-earned, stand in the aisles and cheer moment of emotional release, an episode profound enough to offer hope that Gail will eventually embrace the words of Luke 15:31 – Son, you are always with me, and all that is mine is yours. “Nothin’ comes from nothin’,” Mason replies, baring his teeth. In the adrenaline of the moment, Gail assumes the rebuke is personal, an insult to her as birth mother, but on further reflection she sees the resignation in the utterance, that the words more likely referred to the legacy of Pony Reed. In a novel that traces full circles, the greatest understanding ultimately lies in the statement’s inversion: everything comes from something. And though there may not be a lot of chances to fix every mistake, there are chances.